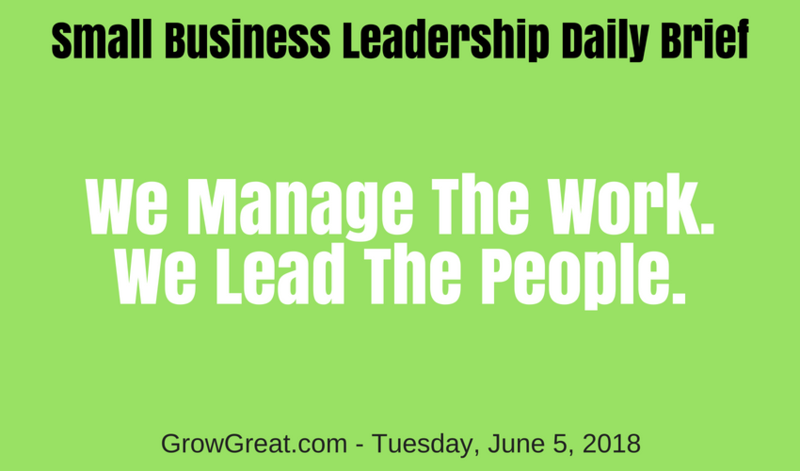 Small Business Leadership Daily Brief: June 5, 2018 – We Manage The Work. We Lead The People. At the beginning, we may be actually doing much of the work. But as our business grows things change. Necessarily. Our role changes, too. We hire people. The business grows and expansion requires additional help. Perhaps even new skills. Over time we realize that our role, as the owner, transitions away from doing the actual work (selling the thing, or making the thing, or delivering the thing)…to helping others do the work better! Next post: Small Business Leadership Daily Brief: June 6, 2018 – If Everything Is Important, Then Nothing Is Important! Previous post: Small Business Leadership Daily Brief: June 4, 2018 – Go Slow, Lose. Go Fast, Win!